In today’s world, there’s a slow but sure shift towards the concept of a sharing culture in which a regular person like your neighbour next door offers you a service and you either take it or leave it. Some of us aren’t very comfortable with this idea as we are all used to the certified “trusted” service providers but to be honest, there are very high rewards to be gained with just that small risk. BonAppetour is just one of the many examples! Here at BonAppetour, we believe in a social way of dining where travellers can meet local hosts, wine and dine, and share stories over food. It’s a great way to enhance your travel experience – see the city through the eyes of a local! Apart from BonAppetour, now there’s also Lunch Kaki, a social networking app which allows people to find someone to lunch with! All you need to do is send someone a lunch request or accept one. There are two kinds of lunch requests though. The first is a Last Minute Lunch in which you have a 10 minute availability time frame to organize a lunch meetup, and the second is a Random Lunch in which you plan a future lunch and wait for a successful match with others. If you’re rather sceptical about it, no harm bringing someone else along with you! It’s actually a great way to meet new people – just squeezing a meet up within a 40 minute break? You never know what could come out of it! What we’d like to suggest is having a Random Lunch at a BonAppetour host family’s home! Bringing many people together for an authentic dining experience can open doors to interesting conversations and before you know it, the ice is broken and everyone’s comfortable with one another. After all, the more the merrier, but don’t forget to check the limit on the number of people which varies for every host. So go out there and get out of your comfort zone. There are many possibilities waiting to be realized! Life could surprise you at the most unexpected of times. Don’t forget to download Lunch Kaki and perhaps, plan a meet at one of our dear host families’ home. Let's hear from our affable and knowledgeable host, Amrita! 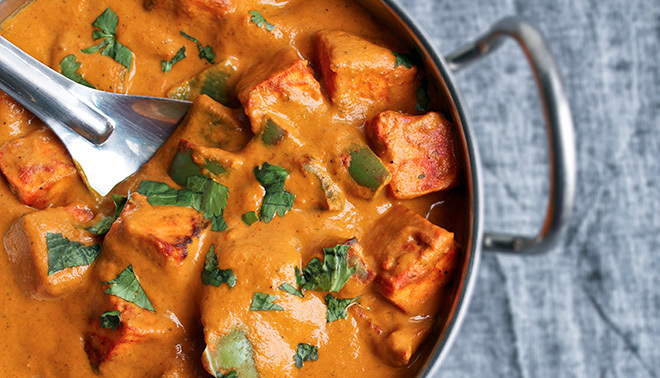 Having a fond passion for food, Amrita is knowleageable about various aspects of Indian cuisine, starting from its preparation methods, diversity of ingredients used, flavours generated as well as the differences between regional variations of the dishes. Apart from cooking, she enjoys travelling and engaging in thrilling activities. Prior to settling down in Singapore, Amrita lived in India and Sydney with her husband. 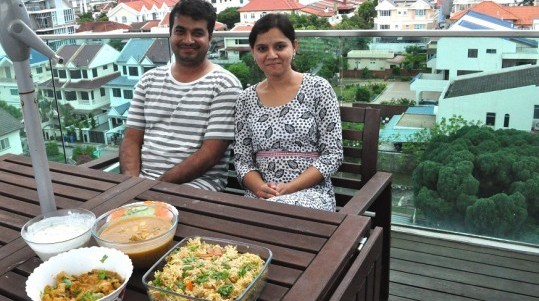 The genial couple is keen to share their experiences and knowledge about Indian culture and cuisine over a delightful rooftop meal at their lovely home! What do you like most about being a BonAppetour host? I get to meet lots of different people of varying nationalities, and share with them the intricacies of Indian cuisine. I enjoy having the opportunity to share my passion for food, and to serve an array of dishes from various regions within India. These dishes range from Southern delicacies, such as briyani rice and dosa, to Northern specialties like chapati and paneer. Where do the locals go to eat in Singapore? What are some places that locals like to hang out at? Hawker centres and fine dining restaurants. What do you feel is the difference between a BonAppetour dining experience, and dining outside in an eatery or restaurant? The BonAppetour dining experience is unique, as you get to meet people from different parts of the world. It is not simply about dining – the experience also provides interesting and insightful conversations, cultural exchange and sharing of good food. Our guests get to learn more about the food that they are served, such as its origins, ingredients used and preparation techniques. Dining in a local's home also makes the experience more authentic. It helps that we offer a rooftop setting, so our guests get to feast on a hearty meal and enjoy splendid views of the city. 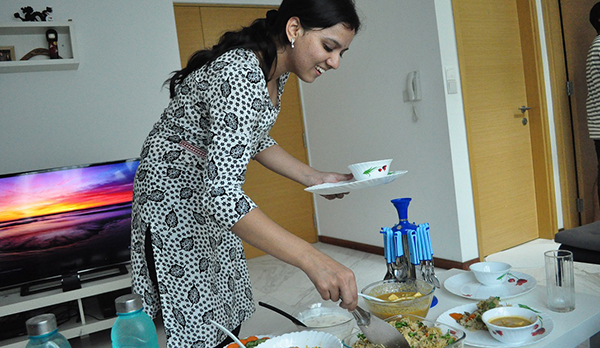 Having a meal in an eatery or restaurant lacks the warmth and personal touch that a home dining experience offers. You are also unlikely to engage in conversations with other diners, and to acquire knowledge about the dishes that you eat. 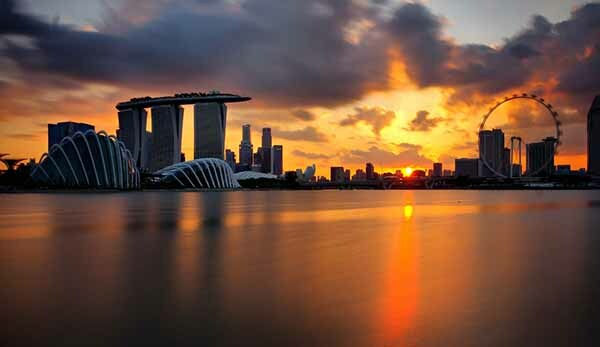 What do you love about Singapore? The weather. It is bright and sunny in Singapore most of the time, which I find uplifting. Even in instances of weather, there is the prospect of seeing a rainbow after the rain ceases. I also like that before sunset, the sky resembles a mosaic painting. Beyond the meteorological aspects, I like that Singapore is a multi-cultural society that is well-connected, efficient and clean. Dining in Singapore: Feastin’ with Locals! Mention food and dining in Singapore, and one immediately conjures up images of vibrant hawker centres, posh restaurants, popular eateries and cosy cafes – dining options that make up the local food scene. There may be a great variety of eateries in Singapore, but these are not the only ways to explore and feast on Singaporean dishes. Home dining experiences are also a great way to savour and discover more about the well-loved local delights. Join us, as we introduce you to three Singaporeans hosts who welcome you with homely and hearty dining experiences! Step into a beautiful home, and inhale the welcoming aroma that wafts out of the kitchen. Make your way to the dining room, and you will be wowed by the array of delectable dishes laid out on the table. 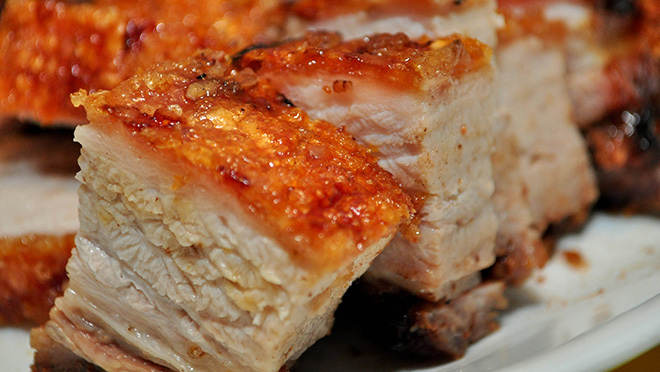 In the middle of the table lies an impressive-looking dish, a plate filled with succulent, tender slices of roast pork belly. A variety of hearty and wholesome selections, such as tangy yuzu-honey prawns, steamed mushrooms with minced meat, chewy Hakka yam abacus and seabream cooked in a savoury black bean sauce are served as scrumptious accompaniments. A mound of steamed rice lies on a plate with a large pandan leaf laid upon it. A variety of yummy-looking sides fill up the plate – crispy chicken, cool slices of cucumber, fried anchovies, fragrant, crunchy peanuts and a sunny side-up egg. Tuck into the rice, and you will be surprised by how wonderfully fragrant it is. The secret to the irresistible fragrance of the nasi lemak lies in the use of two ingredients in the preparation of the rice – coconut milk and pandan leaves. This may be a satisfying and hearty dish, but do make space in your stomach for desserts, for a cold, creamy bowlful of bubur chacha will be served as a sweet treat to end off a satisfying meal. Arrive at Amrita’s, and be prepared to tingle your tastebuds with a wide selection of Indian dishes from different regions within the country. Traditional Biryani rice, a Southern specialty consisting of tender grains with a hint of aromatic spices, will be served, along with a rich chicken gravy. 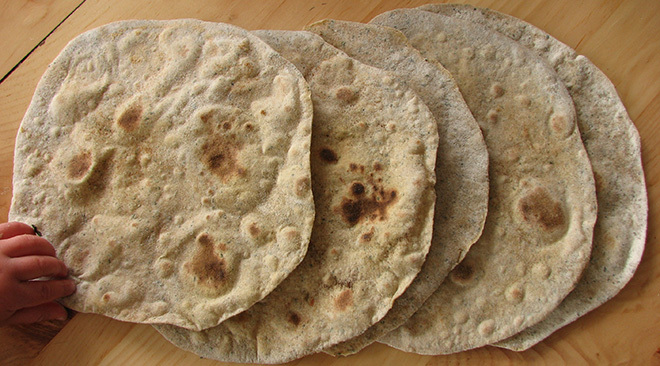 Other Northern delights, such as a smooth, creamy paneer and chapatis, a type of flatbread, will also be prepared. This delicious meal will be enjoyed at Amrita’s rooftop terrace, a lovely spot boasting scenic views. Gorgeous views and a wonderful dinner – who can say no to this delightful dining experience? https://www.bonappetour.com/images/header-banner.png 0 0 BonAppetour https://www.bonappetour.com/images/header-banner.png BonAppetour2014-12-19 05:55:482016-10-19 09:42:18Dining in Singapore: Feastin’ with Locals!